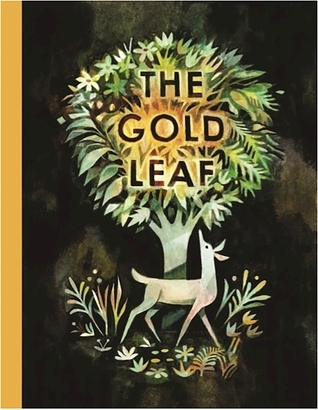 The Gold Leaf by Kirsten Hall, illustrations by Matthew Forsythe. Enchanted Lion Books, Brooklyn New York, 2017. Breathtaking. That was my first response when I came across this beautifully illustrated book. My granddaughter received it for her birthday and with all the celebrating going on around me, I couldn’t give it a proper read. But just leafing-no pun intended- through it, I was blown away. Ok, that last one was intentional. The first page is wordless, just an illustration of the woods in winter. Or is it? There is a large tree on the right hand side of the double spread. But tip the book sideways and the tree looks a lot like a deer that shows up on the next page. See that hole in the tree? That’s his eye. And those branches on top? Those are his antlers. Turn the page and now you see two actual deer, waterfowl and baby birds being fed by Mama. Spring has arrived. Turn the page again and the text tells you the many colors of green that exist in the artwork, as well as in the season of Spring. “Jungle green, laurel green, moss green, mint green, pine green, avocado green, and, of course, sap green.” All the while I am thinking of the many art lessons I could do with this book, if I were still teaching. The possibilities are endless! A few pages in, that deer shows up again, as well as a squirrel and some rabbits. And what have they spotted? A gold leaf. From now on, when the gold leaf shows up, it looks exactly like gold leaf, the art form in which gold is pounded into thin sheets. The animals are fascinated by it. They all want it. But their greed causes them to keep snatching it away from each other and inevitably, the gold leaf shreds into countless tiny pieces. Summer comes, then Autumn arrives, with all its many-colored leaves. Winter follows. The animals forget about their gold leaf. Spring arrives with even more colors of green. The gold leaf has returned. But this time, the animals do not fight over it. They are simply happy to have their gold leaf back. The second to last page is a double spread that shows the animals leaping through the greenery, and look! Some of them have turned golden! The final page pictures them as becoming part of a fanciful tree, as if they are happy to simply exist in nature, as of course, animals are. It is humans, after all, who fight over gold. Pre-school teachers, art teachers, writing teachers–any teacher instructing students of any age could find myriad ways to use this wonderful book. Parents can cuddle in their favorite chair and read it to the littlest ones as the text, which flows like poetry, is quite spare. And of course Autumn is the ideal season to read a book about leaves and seasons. A note explains that “Kirsten Hall’s grandfather was responsible for the gold leafing of many famous gilded buildings in NYC, including Lincoln Center, Rockefeller Center, Carnegie Hall, and the Helmsley building.” This is a stunning book.